POLSON – In 2012, Polson received a grant funded by the Orton Family Foundation that was used to create the Polson Heart and Soul project. According to the Greater Polson Community Foundation, Polson Heart and Soul was a two-year program, which ended in 2014, for the purpose of reaching out to all members of the Polson community to engage in conversations about the future and pick out issues that need to be fixed in order to create a better future for Polson residents. Currently the PEDC is searching for funding to repair roads in Polson. The current city Street Department budget does not have enough funding for reconstruction, according to the PEDC. One of the solutions the PEDC found was to propose a 3 percent resort tax for the city of Polson. Resort taxes create a funding source for designated resort areas to finance a variety of services, according to Northern Rocky Mountain Resource, Conservation, and Development. At a Thursday, Feb. 18 meeting in Mission Bay, LaPiana and City Commissioner Jill Southerland suggested how the tax would benefit the city. —Luxuries, which represent any gift item or other item normally sold to the public or to transient visitors or tourists. For example, tobacco, boat rentals, artwork, etc. Luxuries do not include food purchased unprepared or unserved, medicine, medical supplies, and services, appliances, hardware supplies and tools or necessities of life, according to the Montana Coda Annotated. Polson falls under the requirements to be considered a resort community. One of these requirements is that the population must be less than 5,500 people, which it is, according to the most recent federal census. Once the tax is put in place, then it can stay no matter how large the population reaches. The PEDC is exploring the possibility of becoming a resort tax city. 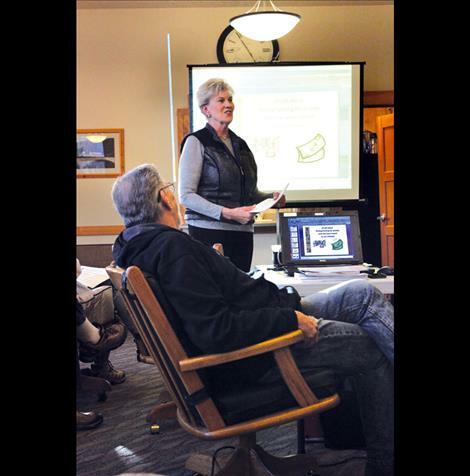 A follow up meeting was held Monday, Feb. 22 at Polson City Hall.